Music was booming in America well before Edison’s 1877 invention of the phonograph transformed it into a utility as ubiquitous as electricity and flush toilets, which took about 50 years. By 1900 there were symphony orchestras in Pittsburgh and St. Louis, opera houses in Newberry, South Carolina, and Central City, Colorado, and added to these exceptional cases were countless theaters in which music of every kind was performed willy-nilly, often on the same bill. In 1870, American strivers bought 80 home pianos daily and filled their benches with sheet music; a decade later, local brass bands were epidemic as sales of cornets and trombones skyrocketed. Yet because 19th-century America produced no opera or symphony composers of note, all this action is still ignored by a defensively snobbish American musicological establishment. Music scholar Daniel Cavicchi isn’t a musicologist and doesn’t think overmuch about composers. He teaches American studies at the Rhode Island School of Design, and traces his ethnographic approach to music scholarship to the Music in Daily Life Project overseen by the seminal popular music scholar Charles Keil at SUNY Buffalo. In 1993 Cavicchi, Keil, and Susan D. Crafts published My Music: 41 interviews with everyday fans that explode the fantasy of exclusive “taste subcultures” so dear to sociologists and marketers (and critics too) just by recounting musical preferences that cross more genre boundaries than experts consider appropriate. In 1998, he turned his Brown Ph.D. thesis into Tramps Like Us: Music & Meaning Among Springsteen Fans, dominated by summaries of and longish quotes from about 100 Bruce devotees that focus on feelings and experiences while barely touching the music itself — even though Cavicchi’s candid passion for that music helps ground and humanize the material. As a critic, I have reservations about a method Cavicchi never suggests is the only way to address music. But as a democrat I welcome it. My Music changed the way I think about fandom and established Cavicchi’s right to write music history his way. The result is Listening and Longing: Music Lovers in the Age of Barnum, a detailed look at 19th-century music consumers that at a mere 192 pages stands as a painstaking, groundbreaking work of scholarship that adds substantially to our understanding of all that disrespected action. Cavicchi’s approach propels him well beyond music proper. He believes that in the context of such “cultures of hearing” as oratory and hucksterism, “music lovers,” as he likes to call them, were key players in the 19th century’s fundamental identity-building project. As country boys tried their luck in the city and young middle-class women edged away from hearth and home, they developed their own ideas about pleasure, leisure, and class. Transformed inexorably into atomized cultural and economic actors, they struggled to make the most of it and enjoyed themselves along the way. While hardly the only attraction of this meaty book, the diary material helps us feel what a precious thing music was for most of human history — how rare it used to be for people to hear it performed by anyone not personally known to them. This is especially true pre-Civil War, when the young men’s reports carry the narrative. More than one stroller with a day job — usually he’s some kind of clerk, although an attorney and a man of means get ink — literally follows the music: attending an opera one night and a minstrel show the next, chasing parade bands or ducking in to hear Ira Sankey’s songs before Dwight Moody’s sermon. Cavicchi makes clear that for some of his sample, music was just one item on a menu of entertainments that gave emergent city folk a chance to hone their tastes into “independent sel[ves].” But his thesis that public musical performances epitomized 19th-century psychocultural development carries weight. At once socially grounded and spiritually uplifting, they were perfectly situated to catalyze character formations in which goodness and pleasure had something to do with each other. Crucially, Cavicchi gives full credit to the role a burgeoning publicity apparatus played in shaping aesthetic preferences music lovers experienced as personal to them. 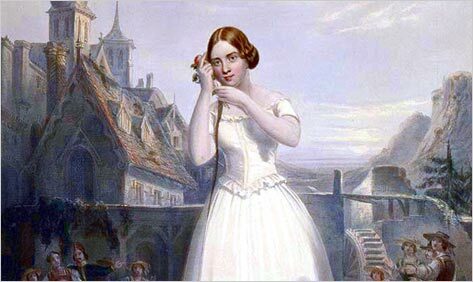 In fact, he begins with a fascinating story about “Swedish Nightingale” Jenny Lind, a singer of sweetly and shrewdly mixed classical and pop airs promoted in 1850 by museum impresario P. T. Barnum into the greatest musical sensation America had yet known. Lind’s directness and purity were so welcome a relief from commercial “ballyhoo,” then a recent coinage, that Barnum made a mint on merch — sheet music, bonnets, mantillas, pianos. But for Cavicchi, her story is no more redolent than that of her most famous fan, Ossian Euclid Dodge, a comic songwriter who bid $625 for a Lind ticket and ballyhooed that extravagance into a lifetime’s success in show business, journalism, and real estate. Dodge’s dodge is the pluperfect example of Barnum’s achievement: the transformation of mere ticket buyers into autonomous participants in America’s musical culture. Just as Cavicchi’s prewar diarists are all male, his postwar contingent is all female. He says and I believe that this switch reflects the changing makeup of his samples. But it has its drawbacks. Dedicated concert-going, especially without approved male companionship, required courage for a woman in the 1880s. But because these women were shut out of the job market, they had to be higher up the class ladder than all but the most privileged of Cavicchi’s male diarists, if only via husbands or families that could stand them a ticket. And in Cavicchi’s account the music lovers among them continued to play their assigned social role as gentility enforcers. Except for a gifted piano student named Edith May Parks, whose 100-word report on a Rimsky-Korsakov piece constitutes the best criticism in the book, they responded more to perceived sincerity and felt sensation than to the higher truths the likes of the overweening Europhile William Foster Apthorp preached from various critical pulpits for the final third of the century. While acknowledging that none of his music lovers called themselves “fans,” Cavicchi argues that they presaged 20th-century fandom. But insofar as this is true, it applies much more to the men than the women, who as both customers and social agents propped up the elitist institutions Apthorp’s cohort agitated for. Diary research was a resourceful way for Cavicchi to transport the sociological innovations of My Music and Tramps Like Us into historiography, and the U.S. was a relatively literate nation. Nevertheless, those who leave written records skew upward classwise, and this is true not just of Cavicchi’s women but of his men. Cavicchi is less explicit about their origins than he should be. But only William Hoffman seems to qualify as one of the young, upwardly-mobile-they-hoped rural laborers who jammed urban rooming houses starting in the 1820s, and not one of his subjects is an immigrant. This matters because there was a whole musical marketplace that targeted such ticket buyers: the minstrel circuit the Virginia Minstrels began with a bang on the Bowery in 1843. He does tarry briefly with the dumbfounding Boston “jubilees” concocted by bandleader Patrick Gilmore in 1869 and 1872, the latter of which joined 2,000 musicians with 20,000 choristers for two and a half weeks of deafening din. But that’s it for the brass band phenomenon, not to mention revival meetings, pleasure gardens, and the exfoliations of blackface minstrelsy, which by century’s end had evolved into a show business none of whose many branches seems to have been patronized by any of Cavicchi’s diarists. Cavicchi acknowledges this methodological bias, which for him is overwhelmed by its advantages: the factual data it provides about a rapidly developing middle class all too easy to overgeneralize, its focus on what his mentor Charles Keil called “consumer listening” as opposed to “player listening,” and its ability to bring empirically verifiable reception theory to a musicology still dominated by the hidebound spawn of William Foster Apthorp. These advantages are real. It’s galling that major musicologists Keil and Cavicchi were constrained to make their academic home not in ethnomusicology, much less the fancy kind, but in American studies. They deserve any foothold they can carve out. And like Cavicchi but not Keil, I believe all musicology undervalues consumer listening. Still, as a partisan of what Cavicchi gingerly designates “the realm of ‘popular’ culture,” I note that even the Springsteen fans of Tramps Like Us tend to talk about their man’s lyrical ramifications rather than the E Street Band rave-ups that send them like they do everyone else in the arena — about what Cavicchi, once again citing Keil, calls “the individual achievement of perfection” rather than the “social play and abandon” Keil has spent a lifetime theorizing. Listening and Longing tells us many things we didn’t know about music in the 19th century. But if you’re really interested, I’d suggest three even more engaging and provocative books, works of speculative research whose absence from Cavicchi’s bibliography saddened me. English prof W. T. Lhamon’s Raising Cain and Jump Jim Crow paint a picture of minstrel-show fans warmer than Cavicchi or any of his sources would venture; art historian T. J. Clark’s The Painting of Modern Life includes a stunning chapter on the Parisian café singer Thérésa that thinks rather captiously about the class prejudices of both the swells and the clerks who cheered a directness as vulgar as Jenny Lind’s was pure. Each provides more musical detail than Cavicchi. And like Cavicchi and Keil, each proves in his own way that music is much too good a thing to be left to musicologists.